As record snowfalls blanket much of the high country and riders everywhere are slashing, spinning, sliding and carving their way through what is shaping up to be an all-time season, SNOWBOARDER is embarking on a year-long celebration of our three decade-long legacy while continuing to inspire multiple generations of riders with the most current, entertaining, informative and cutting-edge content we can create. From a wetsuit-clad and hard boot-wearing Damian Sanders on the cover of our debut issue in the ’80s to the current release of the teaser for the SNOWBOARDER-produced Louif Paradis Beacon project, SNOWBOARDER has never ceased in the pursuit of connecting with highly engaged riders no matter which platform they prefer, be it through magazines, social media, website content, long-form movies, events, contests or festivals. 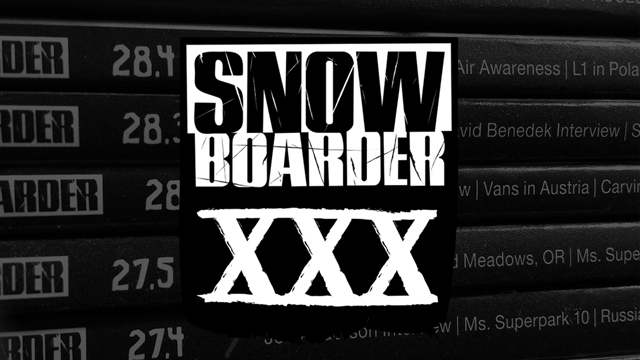 This is a legacy that SNOWBOARDER is committed to building upon for decades to come. "I have been a part of the SNOWBOARDER Magazine family for a large part of its 30-year history, and I am just as eager to embark on paying tribute to this cannon in print this year as I am to bringing Superpark 21 to Mammoth this spring or releasing our fourth feature film with The Snowboarder Movie: Pepper this fall," states SNOWBOARDER Creative Director Pat Bridges. "Just as snowboarding has evolved, so has media, and our ability to connect with an ever-growing segment of the riding community is something we are committed to doing in print, online, socially and with events for another three decades. And after witnessing Sven Thorgren and the rest of the riders send it last spring at Mammoth, I can't imagine what we'll be seeing at Superpark 51, other than me trying to handplant something with a walker!"